Ticomix has made Inc. magazine's Honor Roll as a five-time Inc. 5000 honoree. This multiyear recognition has only been achieved by a small portion of honorees since the list began. 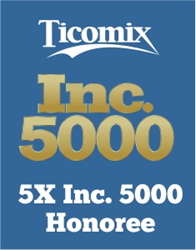 (Rockford, IL) August 16, 2017— Inc. Magazine announced this week, for the fifth consecutive year, that Ticomix has been named on its annual Inc. 500|5000 list, placing it on the Honor Roll of this exclusive ranking of the nation’s fastest-growing private companies. Only 908 companies have appeared five times on the list (not necessarily consecutively) according to the most recent data published on Inc.'s website. This year, Ticomix came in at #3754 with 3-Year Sales Growth of 79%. The list represents a comprehensive look at an important segment of the economy—America’s independent entrepreneurs. Companies such as Microsoft, Dell, Domino’s Pizza, Pandora, Timberland, LinkedIn, Yelp, Zillow, and many other well-known names gained their first national exposure as honorees of the Inc. 5000. "To me this validates the tremendous amount of work our people have done to provide the best service we can to our customers and to generally be a great place to work," said Ticomix CEO Tim Ancona. The 2017 Inc. 5000, unveiled online at Inc.com and with the top 500 companies featured in the September issue of Inc. (available on newsstands August 16) is the most competitive crop in the list’s history. The average company on the list achieved a three-year average growth of 481%. The Inc. 5000’s aggregate revenue is $206 billion, and the companies on the list collectively generated 619,500 jobs over the past three years. Complete results of the Inc. 5000, including company profiles and an interactive database that can be sorted by industry, region, and other criteria, can be found at http://www.inc.com/inc5000. Ticomix provides technology solutions to businesses by fusing best practices with award-winning technologies in the areas of networking, data backup/recovery, service desk management and a host of other customized software and hardware solutions. Ticomix is a Microsoft Gold Partner, Cisco Premier Partner, and a ServiceNow Silver Partner. They are headquartered in Rockford, IL, with offices in New York, Florida and Wisconsin. For more information, visit http://www.ticomix.com or call 815-847-3400.